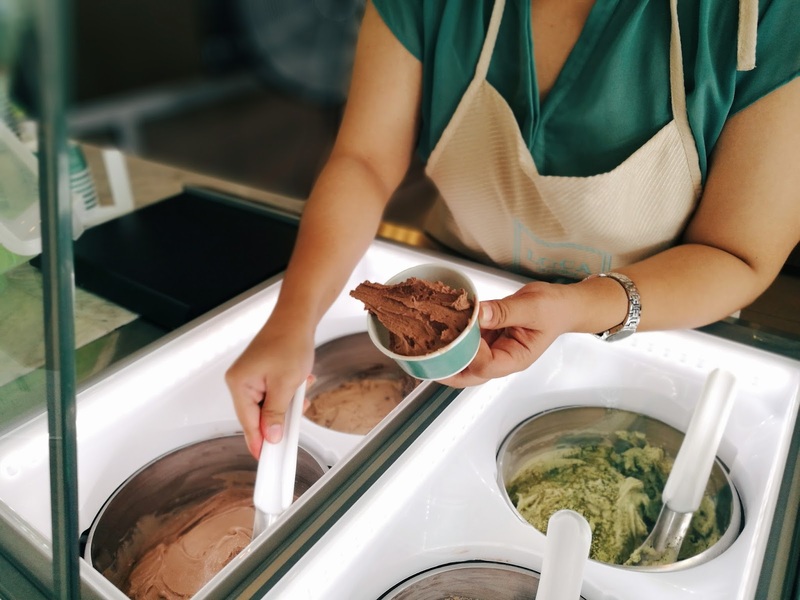 Just when I decided to strive on minimizing my sugar intake, I was invited to a gelato ice cream tasting at Luca Gelateria located at Banilad Town Center. My mind kept telling me no but my heart simply wants what it wants. Lame excuses. LOL. So I foolishly followed my heart and said YES to the invitation. And you know what? I had zero regrets. None. Nada. I was very happy with my decision to go because the gelato at Luca Gelateria are to die for! I won't mind going out of my way just to drop by their stall to grab a scoop or two. Sometimes it pays to listen to what your heart really wants right? It was a sunny Wednesday when I headed to Banilad Town Center and I was shamefully sweating when I met Miss Kara Lim (see photo above), the owner of Luca Gelateria. She welcomed me warmly, I arrived late because I had a meeting at the office, and told me to choose which flavor I would want to try. But there were so many I couldn't decide! They had 12 flavors all in all, six of which are the "regular" flavors and another six are the "signature" flavors. I wanted to try them all but I silently told myself, "Minimize sugar intake! Minimize sugar intake! Minimize sugar intake!" So I just chose the flavor closest to my heart — Ferre-rawr. Chocolate all the way! I asked for only a scoop and gosh the serving was huge that I thought they mistakenly gave me two scoops. Nevertheless, I finished it all until the last trace of gelato in my cup. Delizioso! After I finished my first gelato cup, I was still craving for more. I took a small glass of water (they have a self-service water counter) to clean my palate and off I went to the counter again to choose my next target. My second and third cups were Strawberry Cheesecake and Primo Hazelnut. That time I told the staff to make the serving much lesser for me since I don't think I can finish everything. I also tasted a spoonful of their Salted Caramel, Stracciatella, and Biscottino flavors. They were all so good! Miss Kara scooping their best-seller, Pistachio. When I finished all three cups, I was surprised that I did not feel full or bloated. It was as if I did not eat three cups of gelato! And that's what I love about Luca Gelateria. They give us scoops of pure and authentic Italian gelato — less air, more flavor. They give us real gelato goodness in a cup. I love that their gelato has just the right sweetness to satisfy your cravings. Lastly, the good thing about Luca Gelateria is that they support our local farmers and that's where the milk they're using are coming from. I highly recommend you guys visit and try Luca Gelateria at Banilad Town Center. Their gelato are soooooo good that I'm sure you'll thank me after! Lol. And guys I have to warn you though, one scoop may not be enough! Thanks Kima!!! <3 You should really go try it! I need to try this very soon. hahaha go na Lyss ui! visit na! di ka magmahay gyud! This is the reason why I gained a lot of weight! Lami man gud kaayo ang gelato oi hahaha! Oh my gosh this looks so good, I love a good gelateria!